The medium curly bobs mostly utilize the bangs and the length of the hair. There are countless options of haircuts in the medium curly hair. Here is a beautiful medium curly hair from Emma Stone, enjoy. Emma Stone looked great with her platinum blond curly hairstyle and hot pink lipstick at the Conde Nast Traveler Hot List Party. Her shoulder length curly bob was brilliantly dressed into seductive waves that created body and bounce from her mid-length to her ends. 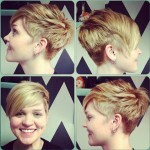 This medium-length bob on curly hair features angled layers that create a bouncy look and give shape to the hairstyle.